Below are some past events that were of benefit to the cause of Bodies of Courage. When possible, we have linked to a story, video or website. Golfer or first timer, please consider putting together a team and coming out for this unique fundraiser for Faces of Courage Cancer Camps. We need all of you to help us spread the word. Please forward this email to your mailing lists. It’s going to be an exciting event and we hope to see you all there. Need Individuals and Groups to Help Santa. 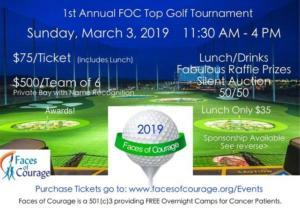 Each year Faces of Courage hosts children ages 2-12 who have been diagnosed with any type of cancer, sickle cell or hemophilia and their well siblings. At this camp, Santa opens a Special Santa’s Shop for the children to come in and use their ‘free’ Reindeer Bucks to shop for holiday gifts for their Moms, Dads, Siblings, Pets, Favorite Doctor and Nurses. Santa is in need of short term elves for the holiday season. Due to a labor shortage, elves are needed for the Santa Workshop Weekend. Santa offers a great benefits package of food, candy and lots of hugs and smiles. Please apply at Faces of Courage today! 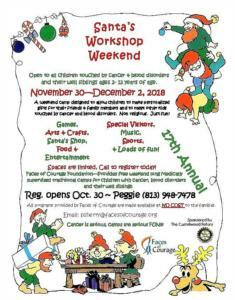 The time has come to sign up to volunteer for the 17th Annual Santa’s Workshop Weekend. 1. Volunteers need to be at least 16 years old. No visitors or volunteers under 16 please. 3. We only have a limited number of jobs and they go FAST. 4. If you are a student who needs volunteer hours verified please bring you paperwork with you to camp. 5. It may take me days to get back to you with a confirmation. Holiday costumes, hats and decorations encouraged. 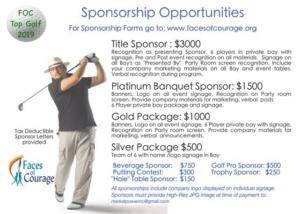 Faces of Courage Foundation provides life enriching experiences to kids, women & families touched by cancer. Santa and Faces of Courage would love for you to become one of our elves at this wonderful weekend for kids with cancer and blood disorders…and their siblings. Yes, the weekend is designed for the entire family. Mom & Dad drop off the kids and get the weekend off… and we get play games, make new friends, eat yummy food, and entertain some amazing children while our amazing Doctors and Nurses take care of their medical needs. Marketing Elves ~ need help spreading the word on Facebook please like us and share our posts to cancer families, doctors, hospitals, support groups that treat pediatric cancer, sickle cell or hemophilia. If you work for a hospital or Doctors office please volunteer to hand out flyers to you eligible families. Email me for a camp flyer. Moving Elves ~ 10 Volunteers to pack up camping items from Storage at iStorage 203 Providence Road units B31 and B37 (BEHIND the B Building) on Wednesday, November 28, at 3pm. Unload at camp around 5’ish. Vans, trucks, and large cars and strong volunteers are a great help. Decorating and set up Elves ~ We will be decorating camp, setting up tables, unloading food and getting the facility ready for Friday. Need 10 volunteers to help get the job done. Parking lot helpers ~ 10 volunteers starting at 4pm – 7:30pm to direct traffic in parking lot. Morning Buddy Elves ~ 50 volunteers. These elves join us for only the Saturday morning activities, they buddy up with a kid and assure that he/she gets to all activities and meals. Needed on Saturday from 8:30 am until noon. Will meet in the Publix Hall. Activity Elves ~ elves needed to coordinate fishing (2), canoeing (2), archery (2), playground (4), Face painting (4) and basketball (2). Hair (2) Nails (2) Photographers (3) Saturday 8:30am – noon. Water Safety Elves ~ 2 certified lifeguard elves needed. Saturday, 8:30am – noon. Santa’s Workshop Elves ~ 15 volunteers set up Santa’s Shop, organize and display gifts, help children choose presents, and wrapping and bagging gifts. Sunday Breakdown Team ~ Ten elves needed to assist with cleanup of cabins, packing and moving back to storage 10am – 2pm. Overnight Elves ~ 30 volunteers 17 years and older are assigned to either a boy’s/girl’s cabin and are responsible for coordinating assigned kids activities. Monitoring their assigned campers for the weekend. Must be able to pass background check. If you are planning on being an overnight Elf. Because of the overwhelming shortage of elves this past year, Santa is hoping you could collect and donate those: new or “recyclable” gifts or that are new or almost new and taking up closet space in your home. Santa holds a special Workshop so that the 80 campers diagnosed with cancer, sickle cell, hemophilia and their well siblings can shop for gifts with their free reindeer bucks. New/Regiftable items (for siblings, Moms, Dads, pets, favorite Doctor/Nurse). Teen gifts are always in short supply. Wrapping paper, scissors, ribbon, bows and scotch tape are in great demand too. Gift cards to Target, Gas, Wal-Mart, Staples, Office Depot, and Publix are a big help to our families. Sponsor the camper/volunteer t-shirts $2,500. Sponsor a camper for the weekend $250. Sponsor a bouncing house $200. NOTE: VOLUNTEER JOBS WILL BE POSTED IN EARLY NOVEMBER!!! 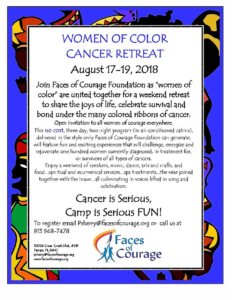 Registration for the 2018 Women of Color Cancer Camp is closed. This camp is open to any women who has been diagnosed with any type of cancer. This sleepover Women’s Camp is provided at no cost to the participants. If you are interested in attending this weekend camp please send me your First and Last Name, Mailing Address and Phone Number. This camp is open on a first come, first serve basis. Join us for our Fun 4th Annual It’s Too Hot Music Festival. 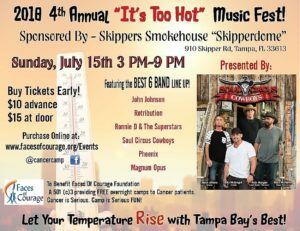 Sponsored by Skipper’s Smokehouse at the SKIPPERDOME and Presented by the Soul Circus Cowboys! Featured Line up and Amazing Talent include: John Johnson, Retribution, Ronnie D & The Superstars, Soul Circus Cowboys, Phoenix, Magnum Opus Big Raffle Prizes! Have I gone Mad? I’m afraid so. Your entirely bonkers, but I will tell you a secret ALL THE BEST PEOPLE ARE. Are you quite mad too? 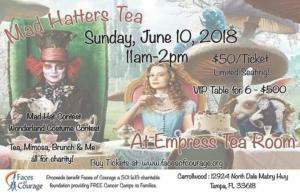 Join us for an Alice in Wonderland themed Tea, Brunch with Mimosas June 10, 2018 Empress Tea Room 12924 North Dale Mabry Highway, Tampa, FL 33618, doors open at 11am……don’t be late for this important date. Dress as your favorite Alice in Wonderland character or don your Mad Hatter style hat for this astonishing extravaganza fundraiser for Faces of Courage Cancer Camps! If you are not one of us, not quite mad just bring your camera and enjoy the rest of us. VIP tickets (table of six with signage) are $500, Individual (open seating) tickets are $50. Brunch, Tea and Mimosa included in ticket price. Silent auction items, costume/hat contest. 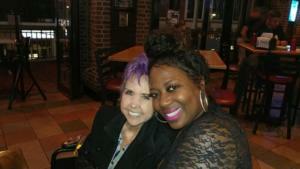 This Mother’s Day Sunday, May 13, 2018, Tiffany Makedah Francisco flew from Southern California to Tampa to become a human canvas for abstract Artist, Lisa Scholder, and become the 50th Cancer Survivor to be body painted for the Bodies of Courage Art Collection. This healing-in-art project was a collaboration started in 2010 between Artist, Lisa Scholder, and Peggie D. Sherry, Founder/CEO of the Faces of Courage Foundation, which for over 17 years has been a Tampa based 501 (c)3 nonprofit that provides (free of charge) day outings, educational events and weekend camps for adults, children, and families touched by cancer and blood disorders. Bodies of Courage is an “Artistic Visual Testimony” to the strength of these courageous Cancer Survivors and for the past 8 years, Artist Lisa Scholder has transformed the lives of 49 survivors. “This project has given them the self-empowerment and determination enabling them to see their bodies as a colorful unique piece of art. Our Bodies of Courage 50th Cancer Survivor to be painted, Tiffany Makedah Francisco, is the former lead singer of Rose Royce, known for their 1976 hit “Car Wash” which won a Golden Globe Award for Best Original Song and also an American comedy film released by Universal Pictures. Bodies of Courage 50th Cancer Survivor-Model Body Painting took place May 13, 2018 at 10:00 a.m. in Tampa and was video-taped by Jim Webb of The Webb Works, Tampa. Fox13’s Linda Hurtado wins an Emmy Award for her story on Bodies of Courage. Read Linda’s Facebook post about the story and the Emmy award.